Women’s clubs used to be terribly difficult to shop for. While women have been golfing for almost as long as men, it seems this would be somewhat difficult to believe. However, just as it was difficult to find anything other than traditional right-handed golf clubs, so it was difficult to find golf clubs for women. Ridiculous. While this is not always the case, let’s face it — women are traditionally shorter than men, have shorter arms, and swing slightly slower. 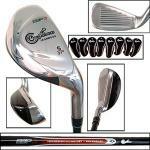 This is enough to warrant a completely different design of club than an average five-foot, ten-inch man. Women’s clubs are shorter. Or petite. 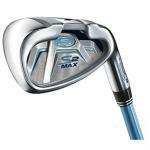 However you would like to put it, they are not just simply men’s clubs cut down and regripped — they are designed to be shorter and still line up correctly at address. Women’s clubs often have a shaft that is lighter and more flexible than men’s golf club shafts. As the swing speed is generally slower (usually resulting in more accurate shots if the women have anything to say about it), this produces a greater “snapping” of the club at the bottom of the swing, resulting in higher clubhead speeds. Women’s clubs often have heavier clubheads. While some argue this is only due to the reason of proper balancing with shorter clubs, I tend to believe it is also to generate a higher clubhead speed to compensate for a shot that may not naturally go as far as a shot from a men’s club. 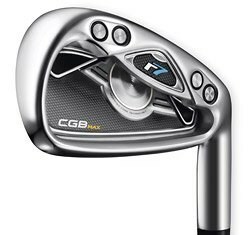 It is evident by some reviews that a well-designed set of irons specifically for women can give even more of an edge for the female golfer, like these R7 Irons by TaylorMade. Let’s face it. Women often don’t feel the need to attempt and “muscle” the ball farther down the fairway — thereby trusting the clubs to behave the way they were intended to work and sending shots down the middle of the fairway. In addition, women’s sets have tended to favor the introduction of the hybrid movement well — giving ladies a nice fairway club to increase distance. 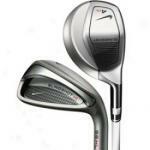 I'm not a huge fan of these Nike Slingshot irons, although they do have some cool technology. I think the turnoff for me is the "Slingshot" printed on the back of the cavity. It looks kind of "Walmart-ish" to me. 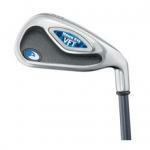 Need more confidence with your irons? Well, these hybrid irons are designed to do that. Not so fast! Don't throw away your irons just yet. If you haven't swung a Medicus club, boy are you in for a treat. Well, by "treat" I mean if you are a masochist, and you like shanking balls across the driving range.